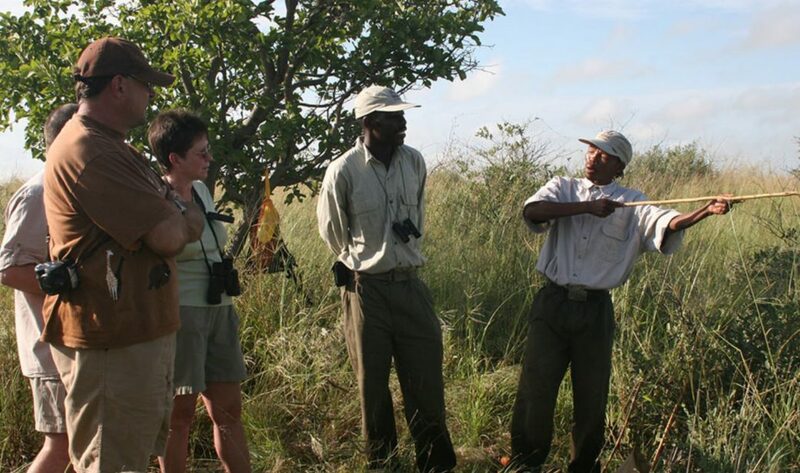 In October I was fortunate to have an opportunity to visit two Kwando Safaris desert camps that offer San bushmen activities in addition to the game drives. It is humbling and inspiring experience to meet the San bushmen…but I didn’t expect to laugh so much. 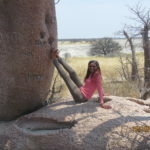 First I went to central Kalahari where I met our San bushman guide by the name of Scuppa. He is such a wonderfully entertaining person, everything he explained came with laughter and a joke, often speaking of himself in third person as he showed us how the San Bushmen used to live. The time flew as Scuppa was so entertaining, making fun of himself in a delightful way. I asked Scuppa was that how can he tell the female bird from the male one. ‘And he replied that normally the female is bigger than the male. Later, when we got back to camp, he introduced his wife to us and said ‘You see! I told you that females are fat and the males are thin like me Scuppa and my wife’. We laughed our heads out as we did not see that coming. He showed us how to make fire from friction, twirling the point of a special twig at a very fast pace and ‘clicking’ away talking to his ancestors for help! It only took him few seconds and ‘voila’ there was the fire. And Scuppa said yes this is what I am talking about, now Scuppa has fire and going to cook the meat. He also showed us the different plants the San Bushmen use for the medications, which plants they dug to drink from when they were thirsty during hunting, also how to track animals to hunt, what they used to poison the arrows and how to position yourself when applying the poison on the tip of the arrow. You would have to check the wind direction so the poison does not get into your eyes. Following that I went to Nxai Pan where I met our San bushman guide by the name of Shoes, who not only did a guided walk with us but was also joined us on game drives. 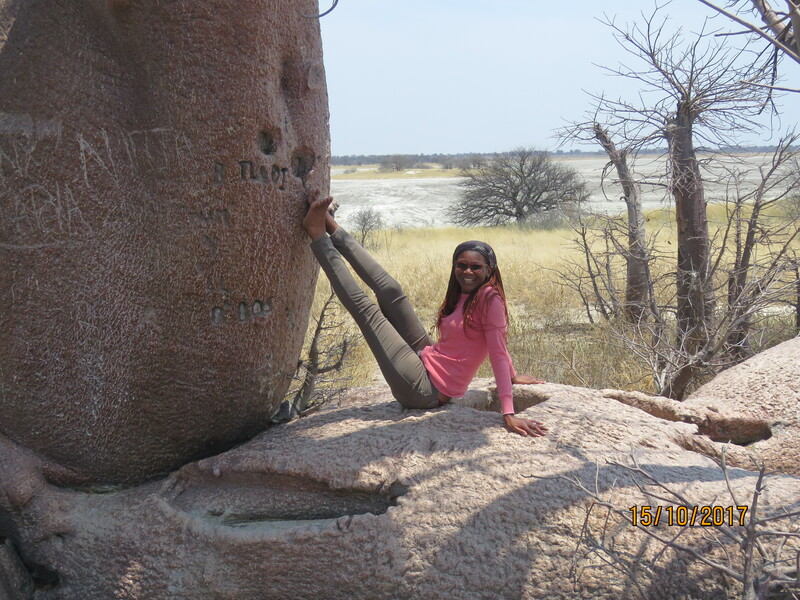 He took us to Baines Baobabs which is about an hour from camp, and during the drive Shoes kept looking left and right left and right like the meerkat on the guard. He would also use his hands to communicate with the driver that he was with where the animal could be or what animal was it and sure enough a few minutes later we would see that animal. 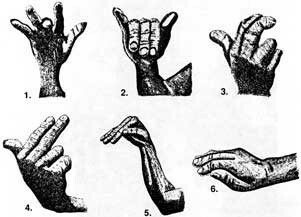 When I asked him about using hands a lot and Shoes said that was way of communicating during the San Bushmen hunting days, with animal signs – so now I know how to make a lion and impala sign. Shoes had some interesting stories, he told us he was born during rainy season and if there is a big cloud cover and they are on a game drive with clients he would just look for a sickle bush tree and all he has to do is communicate with his ancestors and open the sickle bush in half. This way he will be stopping the rain from falling. All in all it was incredible to see the San bushman demonstrate their traditional lifestyle and I wish I knew how to live like that today. It was just an amazing experience. 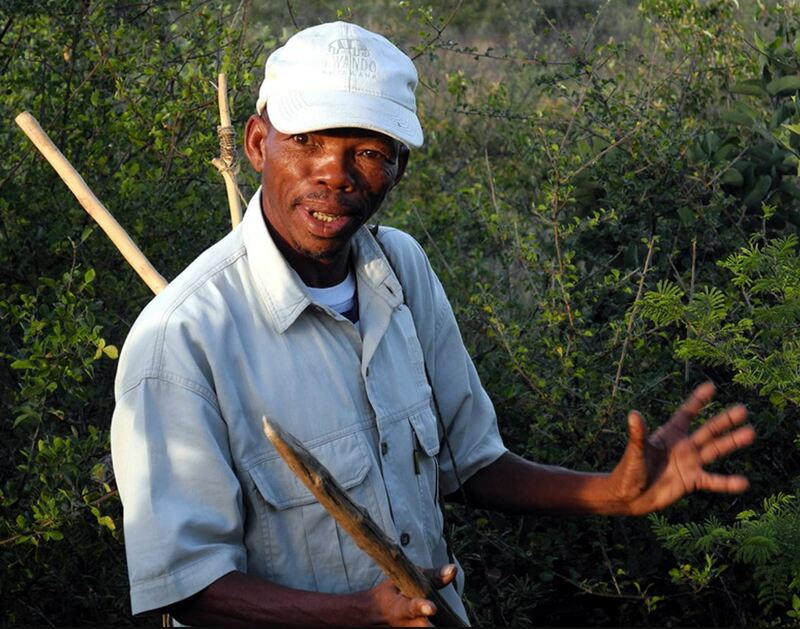 Watch this video from Kwando Safaris on Nxai Pan including some snippets with the San Bushmen guide for more inspiration!